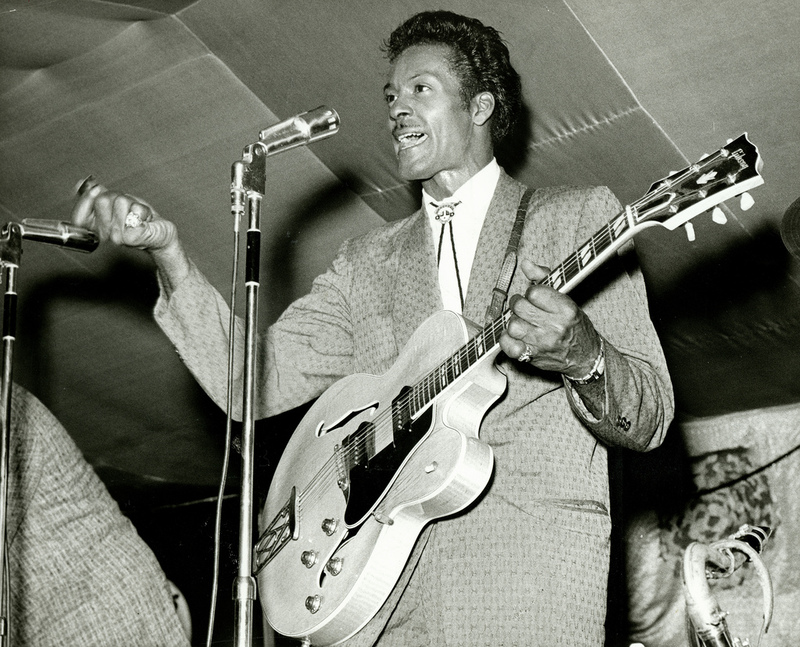 Rock and roll pioneer Chuck Berry passed away, age 90 on March 18, and left a long, permanent shadow that falls over those who took up the guitar after him It's a thick, rich shade from which precious few rockers manage to completely extract themselves. He created the language and vocabulary of rock ‘n’ roll, both as musician and songwriter. His body of work, truly, is the Gold Standard against which all others are judged. The foundation he was the (unintentional) architect of is broad, pervasive, an idiom, at once unique yet familiar, simple yet subtle, a kind of music that could be adapted any number of ways and continue to be renewed with each new visionary we plugged in a guitar and wrote a lyric of joy and confusion. He is, I think, to rock and roll what literary critic Harold Bloom claims for Shakespeare, the originating standard of genius by which all other artists in the arena are held to. What we have in Chuck Berry’s body of work is a collection of songs that achieve that elusive blend of styles in precisely the right proportions. His songs sold millions, it spoke to audiences across racial lines, his rock ‘n’ roll changed the way we engaged the world. It rocked. His work was, essentially, the creation of rock ‘n’ roll as we think of it to this day. A sharp sense of the ‘40s swing, the charge of a rhythm and blues beat, a guitar style combining a bittersweet sting of blues and the sprite, twang clarity of Nashville-style guitar. Berry listened widely, taking in the grit of the blues, the earnest sincerity of country and western storytelling. The swing of R&B, charging it up with country-accented guitar lines, perfecting a limited but resolutely brilliant set of guitar licks that redefined how the instrument came to be played. It’s been argued that Berry was the most important guitarist rock ‘n’ roll has ever known; one can, in my view, be a jazz guitarist although one might not have bothered to listen to or learn Joe Pass or Charlie Christian licks. 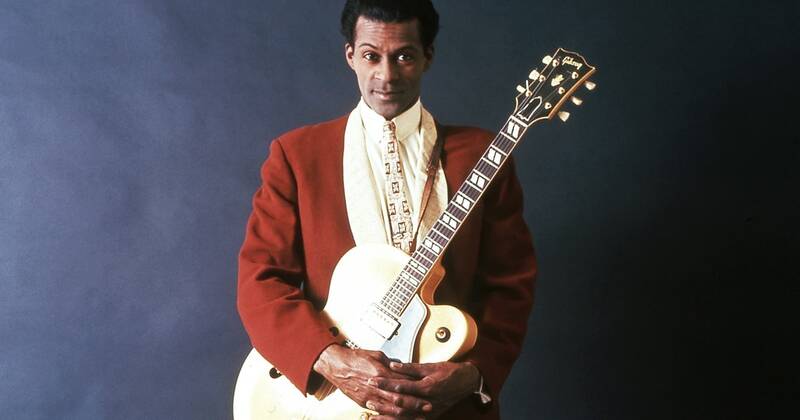 If a player decides to forgo Chuck Berry’s sublime and simple genius and focus rather on the knee-jerk hi-jinx of shredding, one relinquishes the right to be called a rock ‘n’ roll guitarist. If you can’t play Chuck Berry, you can’t rock. It’s that simple an equation. His solos are the best models of economy, with their double-stopped bends and twangy fills, all made buoyant with a crucial sense of swing. Decades of convoluted solos, once the example of what to do on the frets, have been swept to the curb, ashes of former glory, while Berry’s fret inventions are still with us, a part of the American memory. Knowing Chuck Berry’s sound, feel, and off-hand playfulness is a metaphysical necessity for the rocker; it was less a style to master than lifestyle, a way of honing your wits and working your way through the tragic subject matter life awards us with. What makes America great? Chuck Berry isn’t waxing about the morose verities of Patriotism or the wisdom of the Founding Fathers. Berry, In fact, does not concern himself with any idea regarding America as a historical force; he does not tip a hat or alludes to an assumed consensus view that his nation and its traditions were an inevitable consequence of unstoppable millennial forces. He had an idea to project, a narrator to create, a credible voice to fashion and to speak of an America that might be recognizable of most citizen’s radar. Berry’s America was an America as one All Encompassing Present, where the details of revolutions, world wars and struggles for worker and minority rights were irrelevant, if they existed at all; this wasn’t a country where a seeker like Berry’s cheery Everyman had to genuflect to flag and statues of dead white men, this was a place of many constant and permanent marvels. Skyscrapers, long highways, California coastlines, 24 hour diners where burgers are always frying on the grill, this was an America as an Ideal Type that never closes, where the explaining ideology of what America was supposed to become were reversed and were now descriptions of a Nation that had fulfilled its promise to its citizens, new and old. Berry won't discuss God's plan for the nation in the course of human events and isn't much concerned with destiny or ethics or the brick and mortar of building political consensus. Berry was visionary, no less than Blake, Yeats, nor Whitman, and what he envisioned was an America that kept its promise of allowing an everyman like himself (and every person) to engage in Life, Liberty and the Pursuit of Happiness. It's a might Utopian, yes, simply expressed, but within Berry's lyrics is uncommon eloquence that brings up the idea of what the soul of a nation requires. Fewer sermons and more life, fewer lectures and more laughs, less anger and sadness and more joy. Berry's hero was a man who wanted to have his fun and sing about it too. Berry created the rock ‘n’ roll songwriter as we currently understand it, the participant of events giving hot-take impressions or a narrator framing a story of daily frustrations, habits, and quest of young Americans looking for both the meaning of life and fun. His language was colloquial, slangy, and full of advertising coinages and mispronounced foreignisms, place names, an American hybrid of words consisting of short syllables drawn from telephone chatter to movie screen patter. His subject matter was the life and times of white teenagers, a simple terrain, but Berry’s treatment was rich, his language was subtle, his rhythmic accents were unexpected and his rhymes were ingenious, surprising, and fresh, commanding our attention to the tale he framed and relayed like the master he was. The language was direct, emphatic, uncluttered and scarce of decorative qualifiers. The words had immediacy and intimacy, and unforced statement of being, and rocked, swerved and danced on the fast motion rhythm Berry’s fabled guitar chords. Berry, in my opinion, the most important singer-songwriter musician to work in rock and roll, has described his songwriting style as geared for young white audiences. Berry was a man raised on the music of Ellington, Count Basie and Louie Jordan, strictly old school stuff, and who considered himself a contemporary of Muddy Waters, but he was also an entrepreneur as well as an artist. He was a working artist who re-thought his brand and created a new one, something wholly new, a combination of rhythm and blues, country guitar phrasing and certainly clear narratives that wittily, cleverly, indelibly spoke to a collective experience that had not been previously served. It's another aspect of country music that Berry admired and was astute enough to bring into his own reconfiguration of culturally disperse American musical styles, which was the beautifully compact, uncluttered storytelling of masters like Hank Williams. Fittingly, another Williams, William Carlos Williams, warned against abstraction or attempts to make an image or a perception seem more extraordinary than they already were. Our senses already avail us of a universe infinitely astounding as it already is; attempts to link the detail, the object, the fleeting sensation to the addled guesswork that passes for metaphysical investigation merely clouds the beautiful, powerful and amazing. "The thing itself is its own adequate symbol,” said Williams, an idea not lost on Berry. As with WCW, Berry practiced an idealized American idiom, colloquial yet uncluttered with a slang that would age badly, informal but articulate and bristling with quick wit and clarity. I don't think that rock and roll as a form is played out by any means, as the occasional records I have a chance to review or a cursory scanning of what guitar new guitar throttling is available reveals hooks, riffs, lyrics and licks that satisfy one's requirement that rock and roll be, somehow, dually dumb and refined without seeming as if the artist in question is breaking a sweat. What Berry did was create a kind of songwriting that was artful even as it seemed artless. For his part, I would concur that Berry didn't have it in mind to cause a musical revolution that would be such a monumental influence on an astounding number of creators over an amazing number of decades. Clearly, his purpose was to write songs that could afford him a comfortable living or better, and with all the keen instincts of an entrepreneur willing to experiment with his product, he set out to create music that was unlike anything anyone had done before. He was one of those artists where you could discern influences both obvious and obscure--Duke Ellington, Basie, Louis Jordan, Muddy Waters, Hank Williams and other country artists--but, most incredibly, you were in witness of how he transformed his materials into a distinct singularity. We've discussed some of the subtextual matters that are rife in Chuck Berry's body of work, matters that critics given to close readings of texts can expand on and provide us with how deceptively simple this man's music and lyrics and worldview are; there is more here than meets the ear. Berry had no message, of course, in transmitting secret meanings, in being vague, allusive or otherwise conventionally "poetic" with his songs. But I do believe that the artist is not always aware of every submerged implication their music might have. That is the aspect that keeps this kind of music worth talking about, when it's good enough to make you play more than once over a set of months, years, decades.